It’s the most wonderful time of the year – Samhain is here! Join us around the fire from October 11 through November 1. Experience new challenges, a brand-new cache, exclusive seasonal rewards, and community contests! Get a FREE Pale Horse just for logging in the first day! As the boundaries between our world and the next blur, prepare for a month most morbid. What shall bump in the night? Numbers, numbers… what immortal hand or eye could frame thy fearful symmetry? New to Secret World Legends is The Broadcast, beginning with a phone call from Dave Screed. Travel the world and unravel the Numbers Station phenomenon! What secrets does The Presenter keep? Seasoned agents can look forward to scaling difficulty modes, as seen from the recently-released Faction Ranking missions and Occult Defence! Trick or Treat! Well, mostly treats. 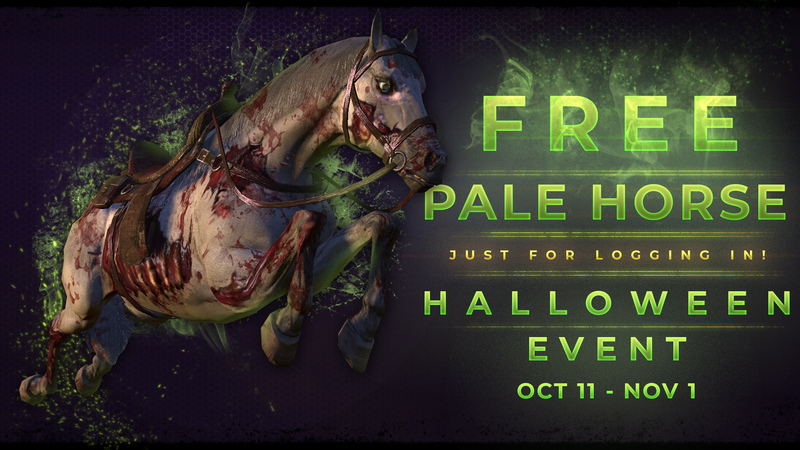 Get yourself some fancy spooky extras just for logging in during the event, including a FREE Pale Horse mount for the first day! Login rewards include a Mysterious Jack-O-Lantern locked by a mysterious force – defeat Jack during a Public Raid to open one! The insidious Jack of the Lantern has once again set his sights on the heart of the world tree, thirsting for its Anima and to claim its power as his own. Not without its defense mechanisms, Agartha has isolated the threat and now it’s up to you to rally together and take Jack head-on! Every hour, a portal near the center of Agartha opens, leading you and fellow agents deep in the tree’s branches where Jack has been captured. In this 40-person raid, combat statistics are normalized through the Equal Footing effect, so anyone can hop in and contribute! The only prerequisite is to have reached Jack Boone in the main story. When you defeat Jack, you are empowered with an Anima Surge, allowing you to open a Mysterious Jack-O-Lantern obtained from your daily event login rewards.